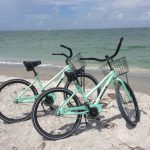 As a guest of ‘Tween Waters, you have access to amenities at their sister properties, including the West Wind Inn on Sanibel. And the pool deck at the West Wind Inn is a family favorite. Wait till you see the views! Their pool area is just steps from the Gulf of Mexico, overlooking 500’ of private beach. And while it’s not nearly as big as the pool at ‘Tween Waters, it is plenty spacious, and it’s heated so you can swim year-round. Towels are provided, as are bathrooms, and you’ll find plenty of loungers, and tables with umbrellas. The tables with shady umbrellas come in handy if you want to eat lunch poolside, which you can, because their Upper Deck Pool Bar serves food and drinks starting at 11 a.m. As its name suggests, the Upper Deck Pool Bar is elevated, overlooking the pool and the Gulf. If you thought the views from the pool were great, wait till you step up to order food and drinks. Wow! Last time we were there, we saw dolphins jumping out of the water as if they were putting on a show at SeaWorld. What a sight! There we were, sipping virgin piña coladas, watching a pod of bottlenose dolphins doing flips, over and over – and we had a clear, elevated view of the entire performance. It was the most memorable lunch I think we’ve ever had. Ever. I hope your family enjoys spending time poolside at West Wind Inn as much as we do. Note that the Upper Deck Pool Bar is open to the public, but to use the pool, you must be a guest or a guest of one of the sister properties. Family at West Wind Inn pool. My niece and sons at the West Wind Inn pool. View of the gulf from West Wind Inn pool. Want to sneak some education into your family’s summer vacation? There are lots of places just minutes from ‘Tween Waters Inn where you can take your family for a dose of knowledge – and fun! Bailey-Matthews National Shell Museum– From 1pm-2pm every day, you’ll find a different adventure: Scavenger Hunt Sundays, Shell Collection Mondays, Fossil Dig Tuesdays…plus guided beach walks and live tank talks. Big Arts– Explore their art galleries or see a live performance by local groups as well as first-class national touring events. ‘Tween Waters is a Platinum Club Co-Sponsor of Big Arts. Clinic for Rehabilitation of Wildlife– CROW is a unique place for older kids to learn about native and migratory animals in the area. Sign up for Wildlife Walks and much more. SCCF Nature Center– Learn about the snowy plover in their Education Center and meander along miles of trails that cut through the quiet heart of the island. Check out the SCCF calendar of events. Visitor & Education Center at J.N. Ding Darling– Entry is free at this fantastic venue filled with interactive displays, programs, exhibits, and a Nature Gift Store. Kids of all ages will be entertained. Wildlife Drive at J.N. Ding Darling– For only $5 a car, your family can look for roseate spoonbills and other colorful birds, manatees, alligators, raccoons, snakes, fish, and lots of other creatures on a four-mile drive through a gorgeous nature reserve. Note that Wildlife Drive is closed on Fridays. I hope you love exploring these family friendly places as much as we have, and I hope you enjoy the rest of your summer. a patient at the Center for Rehabilitation of Wildlife (CROW). It’s fast approaching – National Seashell Day. This shellabration started in 2016 and it always falls on the first day of summer, which this year, is June 21, 2018. As an avid sheller, this holiday makes me very happy. I don’t need a holiday to go seashell hunting, but since there IS a holiday, well, that’s a great reason to visit ‘Tween Waters and get out on their world-class shelling beach! You can even book shelling charters onsite at the marina. Need a few tips to make the most of your shellebration? I’m your girl. I passed my exams with flying colors and am officially a Shelling Ambassador for the Bailey-Mathews National Seashell Museum. If you haven’t been, make it one of the first places you visit while on island. You’ll learn so much – and it’s just a few minutes from ‘Tween Waters. Best time to shell: One hour before low tide till an hour after. Look online for the tide times for the days that you’ll be visiting or visit the onsite marina. Where to look for shells: Walk the high tide line. If you can, walk in the water, too. 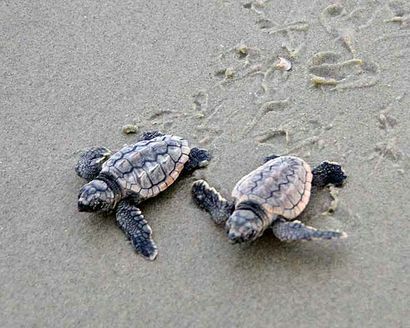 Many shells don’t make it up to shore and are resting just a few feet away. The moon matters: A full moon and a new moon make for a greater tidal event, which brings more shells. I hope to see you on the beach for National Seashell Day! What a great way to kick off summer! Shells found in the water on Captiva. It’s the most wonderful time of the year, and I have to agree. Winter on Captiva is fantastic. The weather is delightful, the shells are plentiful, and there are lots of ways to celebrate the season. Every Friday and Saturday at 6pm from Dec 1, 2017 – Jan 27, 2018, bring the family and enjoy our tropical version of a Snow Party – no coats or mittens required! Enjoy all of the snow, and none of the cold. In need of something cold? Head to the Oasis Pool Bar and order your favorite frozen concoction. There are also frozen treats for the kids, and if you purchase a Tervis tumbler while you’re here with the ‘Tween Waters logo, you’ll get a coupon for a free piña colada. The yellow feet of this small white heron make them easy to identify. Look for these slender and elegant white birds at the marina, dancing along the shore at the beach, and at J.N. Ding Darling Wildlife Refuge. Be merry and bright all season with this special vitamin rich facial at the Spa at ‘Tween Waters Inn. This 50-minute treatment can even out your skin tone and lighten discoloration. Tuesday through Saturday evenings, Captiva House Seafood Restaurant offers fresh, creative sushi. My son’s favorite is the “Sanibel Island” roll with tempura shrimp, cream cheese, cucumber, crab, spicy mayo, and eel sauce. Yum! This is so cool! Check out the live Beach Cam at ‘Tween Waters Inn! Log on and you’ll see Santa’s sleigh and other holiday decorations in the foreground – and the shimmering Gulf of Mexico in the background. What a sight! From my family to yours, I wish you a joyous holiday season and a happy, healthy 2018. One of my favorite things about a winter vacation at Tween Waters Inn, besides the beautiful weather, is the influx of manatees. When temperatures dip to the north, the manatees head south looking for warmer water. Here’s a quick guide of where to find them and what to look for. Look for round swirl patterns in the water. The swirl is caused when their large paddle tail moves up and down. Scan the water for dark masses. Manatees usually surface for air every 3-5 minutes, but can stay down as long as 20 minutes. You might also see their snout and whiskers poking above the water’s surface. Manatee Park in Fort Myers is another great location. The power plant next door pumps out warm water so the manatees gather in droves. It’s quite a sight, and it’s a nice drive from the resort. J.N. Ding Darling Wildlife Refuge is only a few minutes away and in addition to manatees, you can see all kinds of birds and an assortment of wildlife, including gators and otters. ‘Look but don’t touch’ when it comes to manatees. If you’re kayaking or paddle boarding, try not to cruise over top of a submerged manatee; you never know when they’ll resurface. They might pop up right beside you though, and that’s ok! Just admire and enjoy your good fortune. See you at the docks with fingers crossed!